Well. Pretty much as the title says – I did a guest post over on the Master of Malt blog. 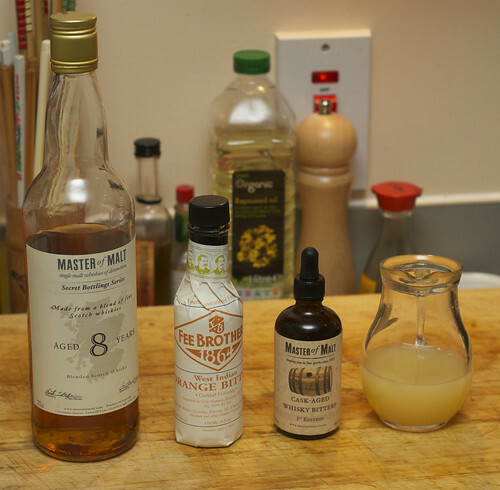 They sent me a bottle of whisky and some bitters (I now have two bottles of their bitters…) and asked me to come up with a Christmassy cocktail. I didn’t use quite as many bits of equipment or FIRE! as CaskStrength.net‘s Neil Ridley, who did the post before mine, but I think I can safely say that neither Neil, Joshua Hatton (who’s up next) or any of the others in the series will have come up with as dodgy a name as Mull of Apple-Tyre. It was late, I had a deadline, stop looking at me like that. With only a shake and the balancing of an overly large cinnamon stick. 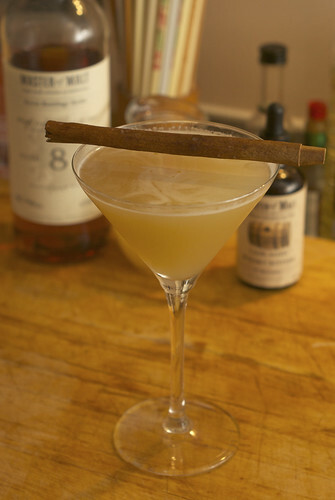 Yes, that is the same cinnamon stick that I used to stir my hot buttered rum. I am frugal. And thus ends my whisky ‘deluge’. More of a spilled half empty bucket, but there will of course be more to come.